The NET Bible is a completely new translation of the Bible with over 60,000 translators’ notes! It was completed by more than 25 scholars – experts in the original biblical languages – who worked directly from the best currently available Hebrew, Aramaic, and Greek texts. As you turn the pages you’ll see the breadth of the translators’ notes, documenting their decisions and choices as they worked. The translators’ notes make the original languages far more accessible, allowing you to look over the translator’s shoulder at the very process of translation. This level of documentation is a first for a Bible translation, making transparent the textual basis and the rationale for key renderings (including major interpretive options and alternative translations). This unparalleled level of detail helps connect people to the Bible in the original languages in a way never before possible without years of study of Hebrew, Aramaic, and Greek. It unlocks the riches of the Bible’s truth from entirely new perspectives. Most of these scholars teach Old or New Testament exegesis in seminaries and graduate schools. Furthermore, the translator assigned to prepare the first draft of the translation and notes for each book of the Bible was chosen in every instance because of his or her extensive work in that particular book – not only involving teaching but writing and research as well, often extending over several decades. Many of the translators and editors have also participated in other translation projects. They have been assisted by doctoral students and advised by style consultants and Wycliffe field translators. 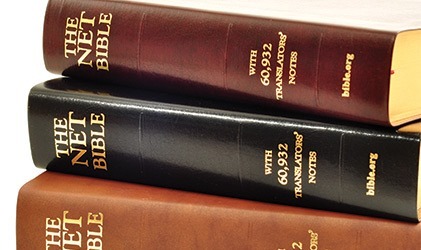 Hence, the notes alone are the cumulative result of hundreds of thousands of hours of biblical and linguistic research applied to the particular problems of accurately translating and interpreting the text.